Members of the Tulipa genus are hardy bulbs that range in height from 10 to 60 cm. Given their popularity it is probably easiest to describe flowers of the Tulipa genus to be Tulip shaped; Tulipa flowers tend to resemble layered upturn bells, and are carried on long stems. 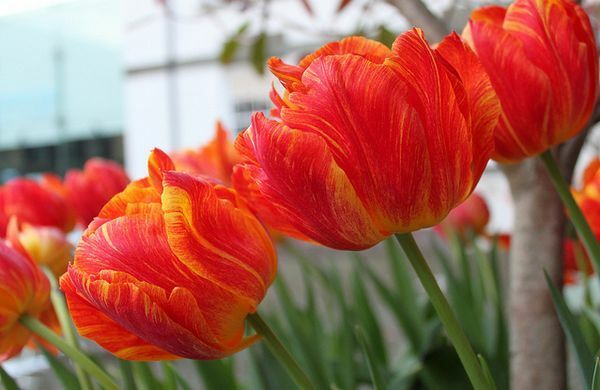 The common name for members of the Tulipa genus is the Tulip. When do tulips bloom? Tulips usually bloom in the spring. What do tulips mean? 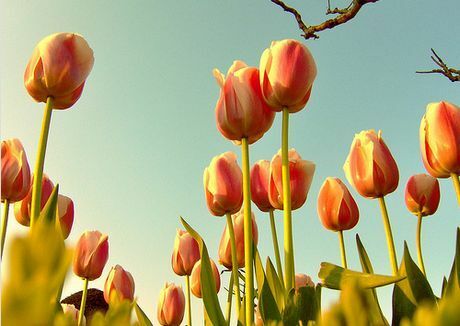 Tulips have several meanings and symbolisms, they are generally associated with love, fame, and enchantment. Thus, some of the main Tulip meanings are a 'declaration of love', 'Perfect lover', 'Beautiful eyes', 'Undying love' (Red Tulip), and Hopeless love (Yellow Tulip). Tulips by Kıvanç Niş; Creative Commons. Tulipa 'Monte Flame' by Col & Tasha. Triple Red Tulipa by Quapan. Height: 4 to 28 inches (10 to 72 cm). Native: Southern Europe. Asia. North Africa. Flower Details: All colours. Bell-shaped, cup-shaped, star-shaped. Usually (but not always) one flower per stem. Foliage: Blueish-green. Strap-like. Usually two to six leaves. Waxy. Alternate. Plant/Sow outside: Usually started from Tulipa bulbs; it can take up to six years for seed grown Tulips to flower. Bulbs: 3 to 5 inches (8 to 12 cm) in cool climates 6 to 7 inches in hot climates (15 to 18 cm). Autumn. Spacing 4 inches (10 cm) to 10 inches (25 cm) depending on species. Ideally, prepare the bottom of the planting hole with a layer of manure and ½ inch (1.25 cm) of soil. Place the bulb on this, and then fill in the hole with soil that has had 5 ml (about a teaspoon) of bone meal added to it. Give the bulbs a good watering. Seeds: 1/8 inch. Germination time: two to three months. Seed: Method 1: Seeds should first be sown into flats in the autumn. Next sink the flat into the ground in an area that offers shade, preferably close to a wall that faces north. Provide a glass/plastic covering. Keep an eye on the flats to ensure that the soil remains moist. Bring the flats indoor at the beginning of spring and keep at 50°F (10°C). Transplant seedlings to their final location in late autumn. Seed: Method 2: In the spring, mix seeds in a moist growing medium, then put in flats, wrap in a large plastic bag, then stratify by refrigeration for three weeks. Next bury the flat as described above. Once seedlings have emerged transplant them to their final location in late autumn. Requirements and care: Full sunlight through to light shade. Very good drainage. Soil pH 6 to 7. Watering during dry periods (and when transplanting bulbs). Provide a light spring feed. Bring bulbs indoors for the summer in hot areas and store at 41 to 45°F (5 to 7°C). 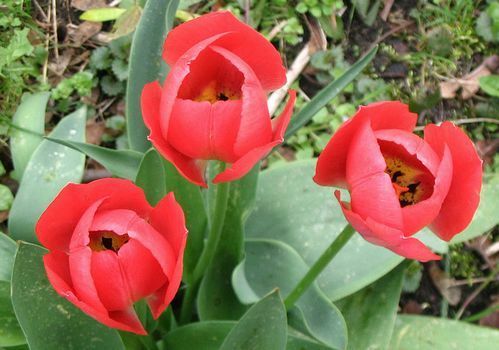 Once tulips have finished blooming, remove the leaves once they have turned brown and died in the summer (the leaves contain nutrients that are absorbed by the bulb so do not remove the leaves too early). Propagate: from offsets, but may not stay true, best results usually come from pure shop-bought lines. Tulips (Tulipa) can be grown from either seed or bulbs; however you will get much faster results if you use bulbs. So just do you go about how to grow tulips? Well, when growing tulip bulbs they should be planted at a depth of about 10 cm (or a little deeper in hot areas) in the autumn in either a sunny or partially shaded area. When planting tulip bulbs, dig a hole deeper then required, and put some manure in it, then put a 1 cm thick of layer of soil and place the bulb on it, then bury the bulb with top soil that contains bone meal. Ideally space tulips at 15 to 25 cm apart (space dwarf tulip varieties at 10 cm), and grow in a slightly acidic to neutral soil (pH 6 to 7). When growing Tulipa plants indoors from seeds, sow at a depth of about 3 mm into flats in the spring. The flat should then be covered in a plastic bin bag and placed in the fridge for three weeks. Remove the flat and sink into a shady part of the garden under glass and keep the soil moist, transplant tulip seedlings as soon as they look strong enough. Although it should take tulip seeds from one top three months to germinate, it may take as long as 6 years before they will bear flowers. When taking care of tulips it is important that you give the tulip bulbs a good watering in when you first plant them. After that only water during prolonged dry periods. Every spring apply a light fertilizer. At the end of the flowering season cut back dead leaves to tidy the plants up.